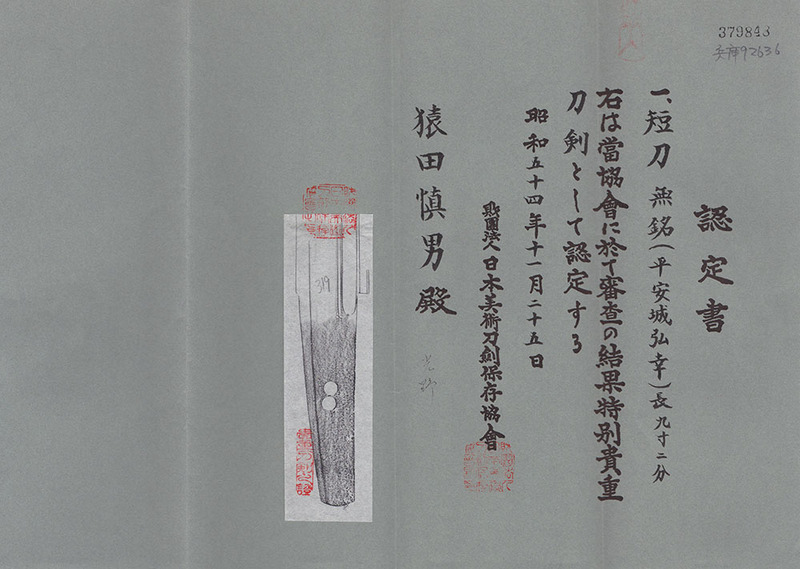 This sword belongs to Jyojyo saku anking. Habaki :Gold foiled single Habaki. Blade length : 28 cm or 11.02 inches. Width at the hamachi : 2.85 cm or 1.12 inches. Era : Edo period around Keicho era. 1596. Shape : Wide and thick, Mitsumune style Tanto. There are Hi on both side of the blade. Katakiri-Ba Tanto. Jigane : Masame well grained. The Jigane is beautiful. Hamon : Nie Deki, Suguha Hamon. There are double Ha. Special feature: Heianjo Hiroyuki was a sword smith of Yamashiro province. He was a studend of Horikawa Kunihiro. He made Katakiri-Ba style blade. From Aoi Art: NBTHK Judged this blade as Heianjo Hiroyuki. The Jigane, engraving and Hamon are elegant. We recommend this rare and precious Katakiri-Ba Tanto for you.